In reference to the article by Bill Wilson (in Baptists Today) titled Conflict as Blessing: Please Don’t Waste This Crisis, we have provided the Levels of Conflict as identified by Speed Leas. Conflicting goals, values, needs. Problem oriented rather than person oriented. Mixing of personalities and issues, problem cannot be clearly defined. Beginning of distrust and personalizing problem. Begin the dynamics of “win/lose.” Personal attacks. Formation of factions, sides, camps. Distortion a major problem. No longer clear understanding of issue(s); personalities have become the focus. Conflict is now unmanageable. Energy is centered on the elimination and/or destruction of the person(s). Depression is defined as “anger turned inward.” Sometimes congregations do not know they are in conflict because they are in a state of depression. The task is to raise their awareness that there are problems to be solved. According to Speed Leas, conflict often develops and escalates in a predictable pattern. It begins as a problem that needs to be solved (Level 1). Problems are issues or challenges that can be described and for which solutions can potentially be found. 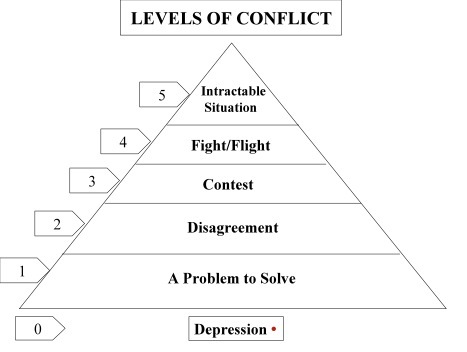 If the problem is not solved, conflict can escalate to level 2, a disagreement. The disagreement is often about how to solve the problem and is a normal, expected part of solving problems. The key is to find ways to resolve disagreement or to convince all parties to come to a shared point of view. If the conflict continues to be unresolved, a level 3 conflict can emerge, a contest. A contest is one in which there are winners and losers and no one wants to be a loser. Sides begin to form and clarity about the problem to be solved begins to diminish. It quickly becomes more important to win than to solve the problem. If the conflict continues to escalate to level 4, individuals and groups begin to act in more aggressive, instinctual ways and the situation can quickly deteriorate. In a fight/flight situation, those who are conflict avoidant leave and those who remain are typically more committed than ever to winning. Principles and dogma are often evoked as justification for various points of view. This level is characterized by strategizing how to win the fight and garnering the resources necessary to do so. Level 5 describes a level of conflict in which hope for reconciliation is generally lost. Emotional responses overwhelm thinking and problem solving approaches. Combatants are focused not just on winning, but even on punishing or getting rid of their opponents. Level 0 describes a situation in which the conflict is not openly acknowledged or recognized. It may have been present for a long period of time and remained essentially underground—unacknowledged and not discussed. This does not mean the conflict has gone away. In all cases except for level 0, the goal is to de-escalate the conflict to the lowest level possible—ideally to level 1. If the conflict has reached level 3 or higher, it is difficult to resolve the conflict without outside help since all the insiders are viewed as having a side in the conflict. For level 0, the goal is to escalate the conflict to the level of awareness. As long as it remains unacknowledged, no work can be done to resolve it.